Oh, no one? Okay. That sounds about right. Ladies and gentlemen, boys and girls, today I will be reviewing a horror-themed walking simulator. Emphasis on walking. 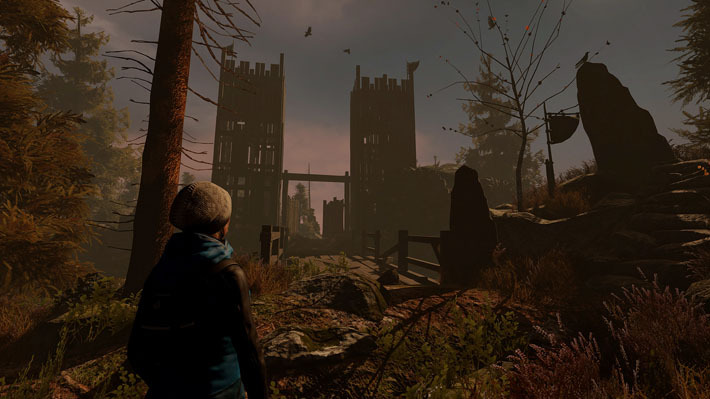 Through The Woods is the first project by the development team Antagonist, and there is a bit to like. However, there's also a lot to improve. 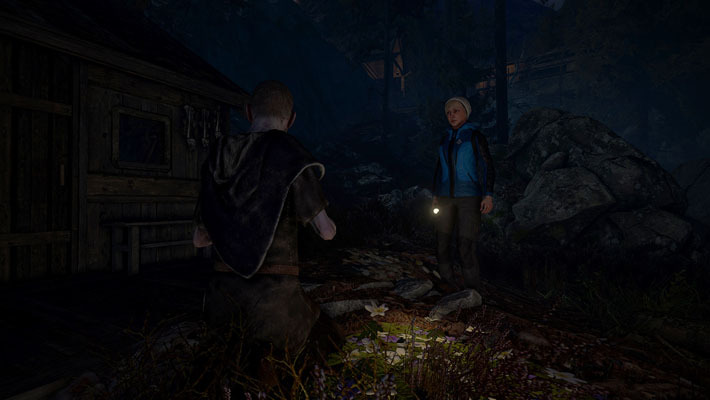 It's a third-person story on the western shores of Norway, with a mother and her son in a house in the woods. They have a dysfunctional relationship, yet both seem to like each other enough that it's never awkward. Within 24 hours into their stay, the son, Espen, is kidnapped by some strange bearded man (hint: NOT Santa). The mother swims and chases after them… THROUGH THE WOODS in hopes of reclaiming her child. He is nowhere to be found, sadly, though he left you clues along the way. The woods aren't the only problem. Weird villagers, witches, and trolls will also impede your journey. While the plot is a bit cliché, it would be enough to keep one's interest if the finer details were there. The controls are your standard WASD, and the mouse is used to look around… Yet, they feel a little wonky. With the amount of walking required, they got annoying. Graphics are okay, but I had to tone them down to get a more fluid experience, and my computer more than meets the ideal requirements. Antagonist, at this writing, is working on a patch to fix this issue. I fear that may not be enough. Five minutes into playing, I was already a bit concerned with my review. The more time I put in, the more my concerns were validated. I'll start with the voice acting. It isn't good, and with such emphasis on a story, it's important that we players care about characters. Good voiceovers will help in that aspect, yet the cast here does not accomplish that. Then are more technical issues, such as the simple act of walking. Are you not able to go somewhere, your character reacts with a buggy twitch. Lots of places where I thought I could go, I ended up twitching instead and again. I also found myself confused as to why Antagonist would pick third-person for this game. First-person is, in my opinion, much better suited for horror games. It would have also saved them the trouble of character animations and 3D modeling, which are sub-par. So technical stuff aside, how does Through The Woods play? WITH. MUCH. WALKING. You can sprint, but most of the time you'll be walking slowly, picking up notes or opening doors. Actions besides walking are too few and far between. I got bored, quickly, and I kept bored as I progressed. The atmosphere, though, is well done, yet, here again, a choppy execution impedes its potential. Consequently, trolls and witches aren't very scary. Even how they move feels buggy as well. I did say there were things I liked, right? Well the scenario and the game's atmosphere are a great start. The Norwegian woods setting is awesome, and they nailed it to an extent, it almost makes the disappointments forgivable. Almost. It is a shame, because with minor tinkering, Through The Woods could have been a great game. Take my review with a grain of salt. Through the Woods has mostly positive reviews on Steam, but for a twenty dollar price tag, I cannot recommend it. It gets a below average score from me, yet I'll close with this: for a first project, Antagonist shows much promise, and I'm anxious to see what it does next. AJ Mallardi has been playing console and PC games since he was 4 years old, and he has a degree in Mass Communications. Originally from the Philadelphia area, and presently in Nashville, with stops in Seattle and York, Pennsylvania, his life has taken him quite a few places. Currently he works 4 jobs: warehouse work, bartender, journalist for House Of Hearts, and OP Noobs (duh! ); with the aspirations of being on television one day.